Water, Water, Everywhere: Is Your Drinking Water Safe after a Flood? Over the past month, snowpack runoff, wet weather, and warm conditions have led to major flooding in northern Utah. When the Bear River crested in mid-February 2017, Garland City, Tremonton, Bothwell, Thatcher, East Garland Park, Riverside, Fielding, Plymouth, Corinne, Deweyville, Portage, and areas below the Cutler dam were hit with area-wide flooding. Roads and railroad crossings were washed out, floodwaters poured into yards and basements, and residents piled up sandbags to keep the water at bay. The safety of our drinking water is often one of our first concerns after a flood. Fortunately, northern Utah’s public water systems didn’t experience water contamination from the flooding. This is due in large part to ongoing, behind-the-scenes efforts by the water systems and the Division of Drinking Water (DDW) to ensure that residents have a safe and adequate supply of drinking water. DDW sets up periodic site inspections to ensure that public water systems follow drinking-water rules and regulations. During inspections, water operators look for areas where contamination could enter the system. Public water systems are also required to pull routine samples from areas that represent the entire water system. Finally, these systems are pressurized so the possibility of contamination is minimal. Most of the public water systems also chlorinate their water. The systems that do chlorinate provide an added layer of protection to their water. Chlorine is fed at rates that leave a chlorine residual. The residuals are there to attack contamination that gets into the water system. 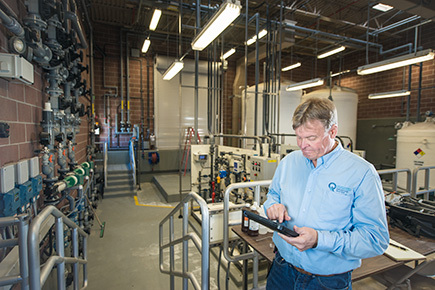 Operators that work for systems that chlorinate can do a rapid test that lets them know if there is residual. Absence of or low residuals would indicate there could be a problem, and the operator would begin pulling samples to test for bacteria. This continuous monitoring for contaminants ensures the safety of the drinking water. If something were to happen, residents would be notified immediately about the steps they should take, such as boiling their water, until samples are clean. While residents connected to a public water system don’t need to worry about the safety of their drinking water, homeowners with private wells may. Flooding can compromise the quality and safety of the drinking water if contaminated floodwater enters the vent in the well casing and goes down into the well. The Bear River Health Department is offering free sampling to homeowners with private wells and urging well owners to have their water tested. If the samples show positive for bacteriological contamination, the health department can provide guidance on disinfection procedures. The health department also recommends that homeowners hire pump or well contractors to disinfect drilled, driven, or bored wells that may have been contaminated by floodwaters. Overflowing septic tanks and sewer systems are another area of concern. Residents with septic tanks should monitor the situation and consider the possibility of private well contamination from septic or sewer systems. The Bear River Health Department advises homeowners with septic systems or flooding near their wells to refrain from drinking well water until it has been tested. In addition to our ongoing efforts to ensure safe drinking water at the affected public water systems, we have been involved in sending out requests for pumps to help pump out vaults and flooded utilities. A tweet was sent out with the help of the Utah Water and Wastewater Response Network (WARN) to member agencies requesting pumps. Circuit Riders from the Rural Water Association of Utah were deployed to the flooded areas to provide onsite assistance and continue to keep DDW briefed on the situation. The Division is communicating with the health departments and offering technical assistance and resources to the affected systems. We’re also working with the Division of Emergency Management to assist with any technical needs that may arise. Our main goal is the safety of your water and ensuring you have a good supply of it. We will continue to do all we can to work with the various agencies and offer any assistance, both during spring flooding and any other emergency situations, to keep your drinking water clean and safe. Want to know more? 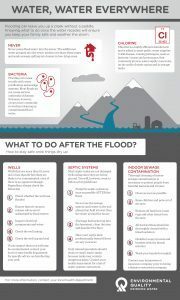 The Bear River Health Department has prepared a series of fact sheets for residents affected by the recent flooding, including instructions for cleaning indoor sewage contamination, what to do with your septic system after a flood, and how to disinfect your well and test your well water. To learn more about how the Division of Drinking Water works to protect the safety of your drinking water every day, visit our webpage. I am the Field Services Manager for the Division of Drinking Water. I have been in the water industry for 32 years. 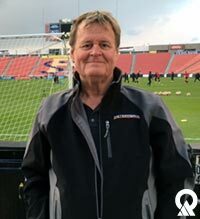 I am adjunct faculty at Utah Valley University and have taught several courses on subjects relating to water.